The EX600 serial interface offers a full suite of diagnostics and programmable parameters to meet the most stringent requirements. The EX600 offers excellent flexibility including digital input, digital output and analog input unit options. 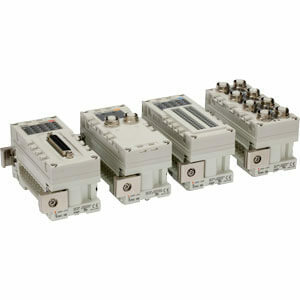 With the use of D-sub output blocks, a maximum of 9 remote D-sub manifolds can be attached to one EX600 communication module. This serial interface is compatible with series SV1000/2000/3000, VQC1000/2000/4000, S0700 and the new SY series valves. Available protocols include PROFIBUS-DP®, DeviceNet™, CC-Link, Ethernet I/P™ and EtherCAT®. Are you searching for something specific? Want to place an order? Let us help you! © 2016 Pearse Bertram. All rights reserved. Designed and developed by The Walker Group. Please fill out this short form and we will be in touch soon.